As a project car owner, there are certain websites I wish I could stay away from, but always end up frequenting, no matter what I do. Whether I'm researching DIY guides, ordering parts for preventative maintenance, or reading about other people's stories of misfortune, you can probably find me wasting my life away or spending my savings, through some website. Researching auto maintenance and finding car parts was a huge part of my job at the Classic Car Club of Manhattan and I'm going to share with you some of my favorite resources for doing just that. Not only is eBay a great tool to use for finding your next project car, but it's also incredibly helpful when searching for that one part that seems to only be available from your local dealer. eBay has a vast amount amount of car parts listed and those parts are often OEM or of similar quality, and way cheaper than what you might even find from someone parting their car out on Craigslist or a forum. Amazon is a great resource for stocking up on various shop supplies such as oils, disposable shop rags, or disposable rubber mechanic's gloves. Not only do items listed on Amazon often come at a lower price, but with shipping options that can be nearly unbeatable. Depending on the make of your vehicle there is more than likely a specialty parts supplier somewhere on the internet. For the various German makes, I always prefer GutenParts.com or PelicanParts.com. For various early American cars or racing parts you may use Ecklers.com, Yearone.com, or Jegs.com. There are tons of specialty parts suppliers on the web which sell OEM parts for less than what your local dealer will try to offer you, will offer quicker shipping, and almost definitely better customer service. Just yesterday I found myself spending my whole morning reading some poor saps horror story on how they bent a rod in their 2015 Subaru WRX (CVT) at 9000 miles due to lack of oil. Spending your spare time reading stories like that or researching DIY guides for preventative maintenance can save you tons of money in the future and surely prevent some headaches. Specific forums for your car may also introduce you to a whole community behind your ride and shed some light on various meetups in your area. 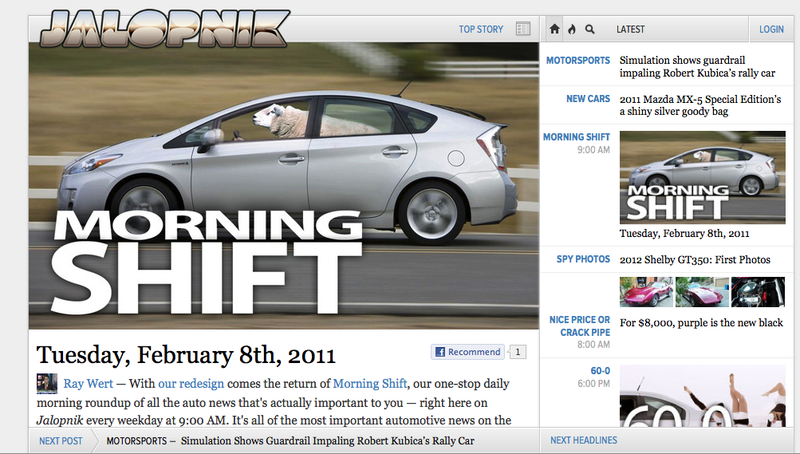 For a long time, Jalopnik and OppositeLock have been my virtual home. As a project car owner, I always enjoy sharing my stories and words of wisdom(?) with fellow enthusiasts, as well as learning from their successes, or catastrophes. Do you have any other automotive websites you frequent? Any positive or negative experiences with the ones I listed? Please share below.